Here’s a fun web video for everyone to enjoy from all of us here at Wireless Watch Japan! We stopped by KDDI’s Designing Studio in Harajuku yesterday afternoon with our long list of groovy gadgets we wanna have for Christmas and to sit on their robot Santa’s knee. As it turns out, maybe we’re getting a bit too big for that — but it was fun anyway! Dressed up for the holidays, this robo Santa-san unit made a splash during the 2005 International Robot Exhibition held recently at Tokyo BigSite. 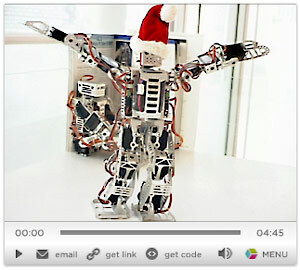 According to Designing Studio’s Manager Natsuko Kimura, the robo Santa was created by KDDI’s partner company I Bee K.K., which develops products based on Bluetooth technology. While we were there, it seemed like a good idea to send best wishes to our faithful WWJ visitors, recorded from under KDDI’s three-story tall Christmas tree. Our special year-end video program from last year proved to be rather popular, so we just had to do something that screamed ‘unique Japan mobile’ again for 2005. We hope you enjoy this clip! We’ve had another fantastic year covering the ‘business of mobile in Japan’ and of course we really look forward to watching, on your behalf, how the wireless market continues to develop in 2006. 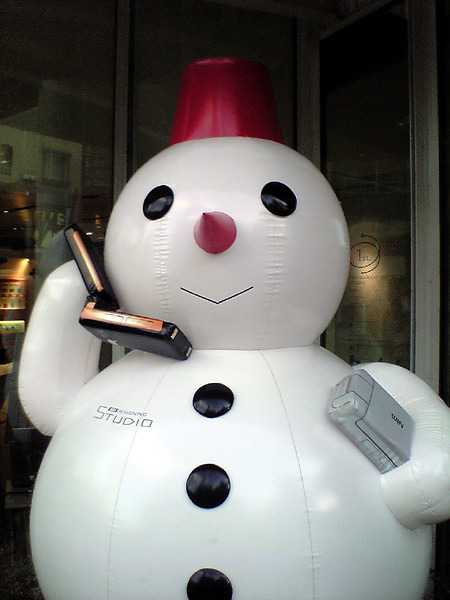 Meanwhile, we hope you and yours have a safe and happy holiday season and all the best for 2006!